The March elections in Italy, saw a center-right coalition take first place, but failed to achieve a majority. 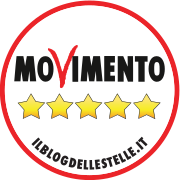 The upstart anti-establishment 5 Star Movement (M5S), is now the largest political party in the legislature, taking over 30% of the total. That created a hung legislature, which necessitated the building of new political alliances in Italy. 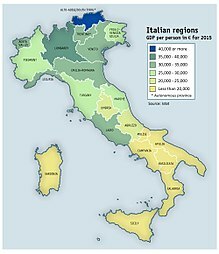 Italy is the 3rd largest economy in the Eurozone, 9th largest globally, with a GDP (Gross Domestic Product) of $1.934 trillion USD (United States Dollar). Ongoing political and economic instability here, has reverberated throughout the European Union (E.U.). It is important to note, that the economy has still not returned to the level of GDP, that existed in 2008. With near 60 million inhabitants, the country is far too large and important to Europe,to remain in crisis mode. This is not Greece,where insolvency was manageable and could be tolerated in the short term. The center-right coalition headed by Forza Italia which garnered 14% of the total vote and the right wing League, which took 18% of the electorate, together took another third of the vote in the March election. The League formerly known as the Northern League, has benefited enormously, from the public outcry, over the waves of migrants arriving in Italy. The endless waves of refugees coming from North Africa over the past four years, are escaping for both economic and political reasons. Along with the third populist party, the far right Brothers of Italy, the anti-establishment parties have captured well over 50% of the vote. The governing center-left Democratic Party (PD) led by former Prime Minister Matteo Renzi, came in a humbling second place. The party now commands less than 20% of popular support. This is close to 50% lower than its peak, in the 2014 European elections. The Democratic Party was the senior partner in the previous coalition government, headed by Prime Minister Paolo Gentiloni. In the recent election, it barely received more votes than the League. The PD appears to have been held accountable by the electorate, for the slow pace economy and the stubbornly high Italian unemployment rate, which remains at 10.9%. Youthful joblessness actually slightly increased in February, to 32.8%. Given the election results,it became impossible for the previous government to remain in power, beyond the length of time needed, for the creation of a new government. Italy is using a new electoral system, in which a political party needs to reach a 40% threshold, in order to form a new government. This made a minority coalition, much more unlikely. The largest political parties on the populist right, needed to form an alliance, in order to convince President Sergio Mattarella, they could actually form a majority. Populist parties have been on the rise throughout Europe and Italy, is no exception. Support for populist radical right parties, is now higher than it has been in 30 years. In the most recent European parliamentary elections, they have on the whole received 16% of the vote total. Twenty years ago, these parties were only attracting a mere 5% of the electorate. There are seen as being anti-elitist, nativist,along with a strong emphasis on law and order. Right-wing populists represented in the parliament are represented in all shades of blue. The populists had gained the most traction in Eastern Europe and Scandinavia. Their greatest electoral strength, can be found in Hungary and Poland, where they now have taken control of the national government in both countries. In Poland, the Law and Justice Party and Hungary’s Fidesz exhibit true populism, coming from the rightist point of view. They have both benefited enormously, from opposing further migration from the Middle East and North Africa. 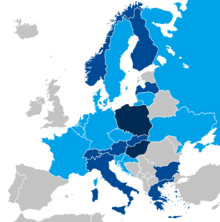 Similarly the leadership in these countries along with Czech Republic (Czechia) and Slovakia, collectively known as the Visegrad Group, have all used nationalism to advance their respective political agendas. Bulgaria and Romania have more fractured politics, so nativists have not yet gained political power there. In Denmark, Finland, Norway and Sweden, populist parties have already been able to garner over 20% of the electorate, in national vote tallies. This permits them to influence legislation, in the representative assemblies in all four nations. The AfD has now become the third largest party in Germany, in the 2017 elections. At 12.6% of the vote, it has earned representation in the German Parliament. In close votes, AfD party leaders will be able to block legislation. It is the first time in over five decades, that a far right party has entered the Bundestag. In last years elections in France, the populists under the National Front banner, were able to gain support, from a full third of the electorate. 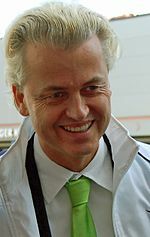 Geert Wilders, leader of the Party for Freedom, the populist party in the Netherlands. In Austria, the populists from the right, have already taken power, as of last year. This became possible by combining political conservatism, with the rising force of nativist populism. Even among the normally tolerant Dutch,the Freedom Party has become the second largest political party in the Netherlands. The issues that propel these politicians forward ,along with immigration and nationalism, include crack downs on corruption and crime. They also invariably oppose, further European Union integration, as well as more progressive policies in social lifestyle. These politicos find a receptive audience, in a restive population, anxious over the negative effects of globalization. The latter has led to the loss of traditional manufacturing jobs, resulting in rising economic inequality and uncertainty, among the working classes. 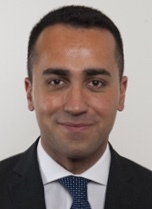 A coalition of the League and M5S, may offer the country some political stability. This combination will have clear-cut majorities in both houses of the legislature. The problem is internationally. A truly populist government may well unnerve foreign investors, creating further apprehension in European stock markets. Both parties have already pledged to to exceed the Eurozone budgetary limits, which have set upper limits of government deficits, so they will not exceed 3% of GDP (Gross Domestic Product) This has been seen, as the best way to prevent another sovereign debt crisis. A number of countries including even France, exceed the limit, but have at least pledged to bring government spending, down towards the 3% limit. This is not the case in Italy. If electoral pledges from both parties are actually put in place, tens of billions of Euros will be added to national debt, which is already more than 130% of GDP. The Eurozone average is 87%. Italy has the second largest debt level in the Eurozone. There are increasing worries among investors, that the country will be unable to deal, with this pressing issue. The two populist parties have different constituencies based on geography. The Leagues power base is largely in the north, despite efforts to have a more broad appeal. M5S had sweeping electoral success in the south. There could be trouble among their individual voters, as the two parties work together in a united front. 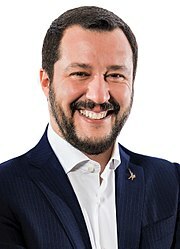 Matteo Salvini from the League and Luigi Di Maio leader of M5S are cooperating on a number of issues. At the end of March for example, Salvini gave qualified support, for the idea of universal basic income. How this is financially affordable over the long term, is still not part of the political discussion at present. At the end of May, after endless weeks of talks and warnings of new elections,a political coalition was finally stitched together. 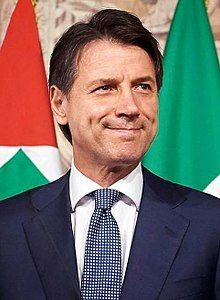 An inexperienced Giuseppe Conte would now become Prime Minister. 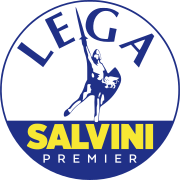 Under the deal struck, the League’s Matteo Salvini and 5-Star leader Luigi Di Maio, will be deputy Prime Ministers. Together they are likely to have an inordinate amount of influence, over the untested Conte. 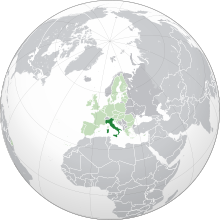 Italy on a global map, shaded in dark green, light green is the European Union. Their combined platform is calling for lower taxes, at the same time there have been pledges for higher social spending. Without economic growth, the budget deficits will simply ratchet ever higher and add to the punishing high debt, the country is already saddled with from previous profligate governments. Throughout the spring and into the summer, the Italian markets remained volatile and unstable. The political impasse and dubious platform of the new incoming government, added to investor uncertainty. It did not help, that both partners in the coalition have in the past, called for a referendum to make a determination, if Italy should even remain in the Eurozone. If the Italian electorate would vote to leave,it could well signal the end of the Euro and the single currency union. Leaving the Eurozone would not necessarily, bring the immediate financial relief, that many voters would expect. Much of the substantial debt Italy has accumulated over the years, is held by foreign banks. 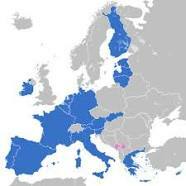 European nations shaded in blue are members of the Eurozone. The first real financial test for the new government, will be the submitting of a budget, for the upcoming fiscal year. Italian lawmakers will have to approve this blueprint and then send it to the European Commission, before mid-October. The populist government is promising a budget that will provide citizen’s income, pension reform and tax cuts. Collectively, these will add billions of Euros to the deficit. The previous government had carefully and responsibly reduced expenditures so, the deficit was targeted for only 0.8% of GDP. This is far below the 3% threshold, as the maximum prescribed by the European Union. Analysts are expecting, an increase of at least 1.7% of GDP. This will more than double, the previous target. It will also make it more difficult, in servicing the present debt. Most experts will likely be content, if the deficit remains below 2%. The League will push for more tax reforms and the M5S will lobby for more social spending, but they will be somewhat constrained by the overall cost. The Chamber of Deputies is the lower house of Italy. Investors will no doubt carefully scrutinize, if the spending plan is sustainable or is is just pandering to the electorate. The Italian people have been led to believe for years, that the government could borrow and spend recklessly, with little to no consequences. If the run up in debt had been used to finance needed infrastructural improvements, in the effort to increase productivity, it might have been worth the gamble. Instead it was spent on unsustainable social programs, that has left the country with staggering debt and sluggish growth. The hangover of debt in Italy and elsewhere in Europe, has somewhat undermined the financial system. The banks were destabilized, leading first to the financial crisis in 2008. This soon was followed in 2009, by the horrifying sovereign debt crisis,which peaked from the years 2010 to 2012. The nations of Cyprus, Greece, Ireland, Portugal and Spain each in turn, became unable to repay or refinance, their government debt. In addition,they all faced challenges, concerning their domestic banks. Italian assets have continued to underperform this year. The main stock index is still down 1%, since the beginning of 2018. The yield on the 10-year Italian bond is still around 2.9%. That is 1.6% higher than the equivalent bond from Spain. Italian bonds are now at their highest level, since the crisis of 2014. A sign of investor anxiety and lack of confidence, with the current fiscal situation, is exemplified by the fact that corporate bonds in Italy, are still outperforming sovereign debt. A major problem that Italy faces, is the lack of growth both domestically and throughout the Eurozone. For the first half of 2018, the economy in the zone increased a mere 0.3%. This is the lowest rate of growth, since the second quarter of 2016. Map of Italian regions by GDP per capita. 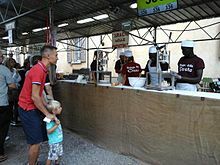 In Italy the economy slowed from 0.3% in the first quarter to only 0.2%, in the second quarter. At the end of 2017, the Italian economy was expanding at double that rate (0.4%). The International Monetary Fund (IMF) has identified that the combination of political uncertainties and the overall weak Italian economy, have further weakened the Euro. The financial system in Italy, is still dealing with a high stock of non-performing loans (NPL) in the banking sector. It leaves the country vulnerable to outside shocks, that may cause a new banking crisis. Italian banking stock practically crashed in June of this year. The latest example of this being, the large exposure Italian banks have in Turkey. The Turkish lira is in free fall, due to ill advised government policies and sanctions from the United States. The country will soon have difficulty in servicing loans from banks in France, Spain and of course, Italy. Another issue facing the new government, concerns the migrants and refugees, that have swamped Italy. It has been reported that Matteo Salvini, has called for the deportation, of all undocumented individuals. This would be in violation of European asylum rules. These regulations of course, are growing increasingly unpopular in Italy, given that the country is a front-line state. Arrivals will come to Italy first. Nations elsewhere in the EU, are growing progressively reluctant, in accepting new migrants. Italy’s new government is insisting on a more streamlined system, of sharing the burden of migrant arrivals. There is also the expectation, that more money should be allocated to countries within the E.U. that are under increased fiscal strain, due to the numbers who have already arrived. The new Italian government has already taken the step, of refusing to take in some recent migrants. It is likely this policy will escalate, as the E.U. fails to create a more equitable, overall framework. In foreign policy, the populists are keen in moving the country, in a more independent direction. They have for example, called for the lifting of the sanctions against Russia. This again, is at odds with most of the other countries in the E.U. The election in March has provided somewhat of a mandate, that voters want change. The populists have promised that new endeavors abroad, will be based more on what is in the interest of Italy, rather than the entire E.U. The populists in Italy as elsewhere, were swept into power due to a restive electorate, that has tired of the status quo. The political movement will be expected to deliver, on its promises. Success will depend not only on achievement, but in tempering expectations of impatient and exasperated voters.